Does your life reflect your priorities? 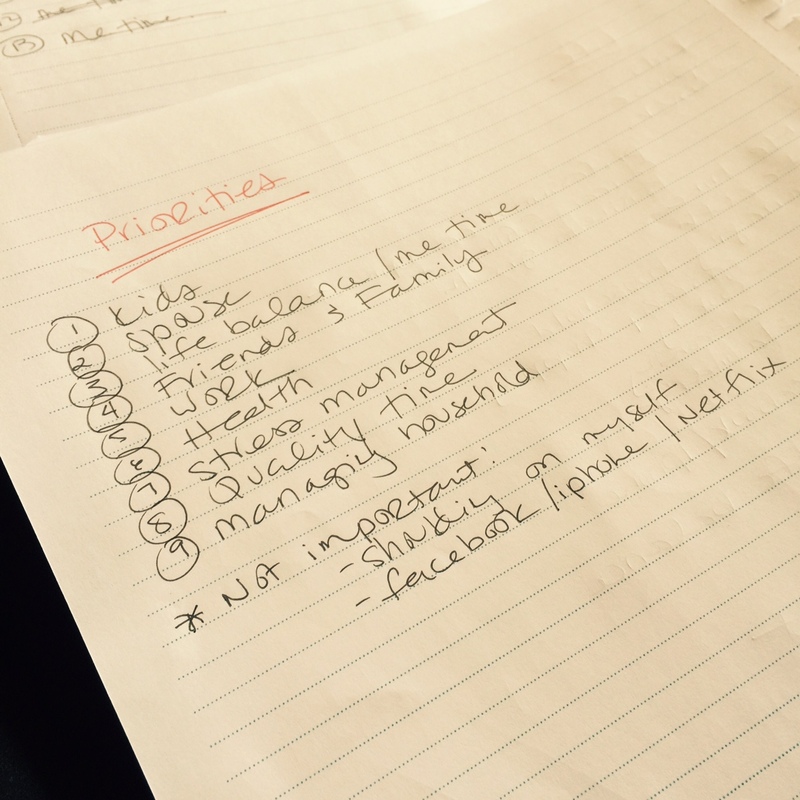 These days, few of us live according to our values– our true priorities. That is, not unless the amount of time we spend on Facebook, Instagram and Pinterest aligns with what’s important. But how do we live in a way that reflects our priorities? How do we even identify them? Unsurprisingly, figuring out what you value is the first step. Try the quick step-by-step activity below to help you check in with yourself and reconnect with what’s really important to you. I don’t mean the physical, material possessions. The “things” I mean can reflect areas of your life that take up your time, energy, emotional attention, or life space. It can include things you do, want to do, think about, worry about and take up your time, regardless of how you feel about them (like commuting, for example). Items on this list will vary greatly from person to person, so go wild. — This is your list—put anything you want on it. 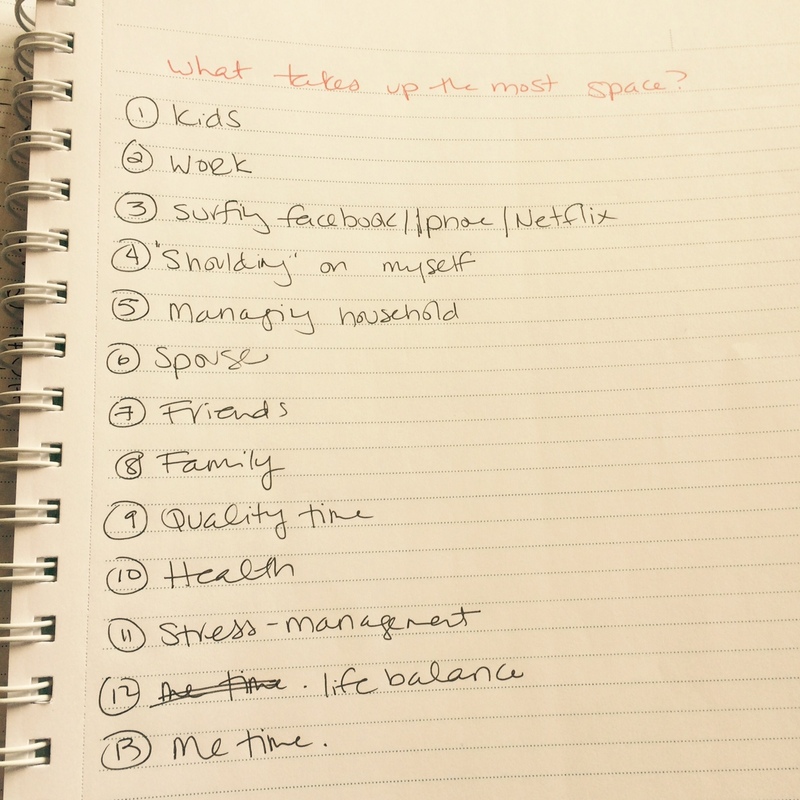 List them in order of how much of your life space/energy/attention they actually take up. 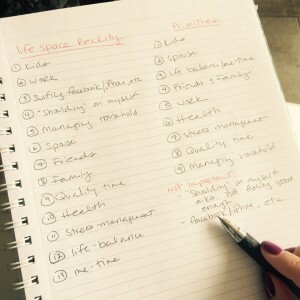 I find that many of my clients want to prioritize themselves or enjoy some “me time,” but because they feel like they should be putting others first, this tends to fall to the bottom of the list. In other words, our priorities are riddled with self-judgement. Your third list will be a priority list. 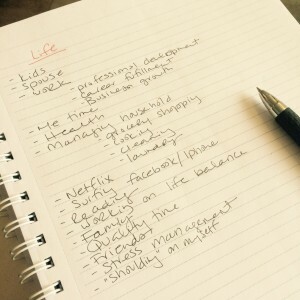 Take a look at the ”things” you first wrote down and write them in a new list, in order of how important they are to you. Don’t be surprised if this list looks quite different from how you actually spend your time and energy– this happens to most of us. It’s normal for our priorities to shift based on what’s happening in our lives. 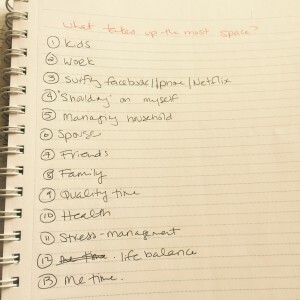 As the list develops, you might find the need to group some things together, like “life balance” and “me time.” You may find that some of the things taking up space in your life aren’t actually priorities at all. Sorry self-judgement, we don’t actually want you here , bossing us around! Put your lists side by side. How do your reality and true priorities compare? What stands out for you? What surprises you most about this comparison? What doesn’t surprise you at all? I often find that our lives don’t reflect our values, but somehow we have been sucked into giving so much of ourselves to things that are not important. How does your comparison make you feel? 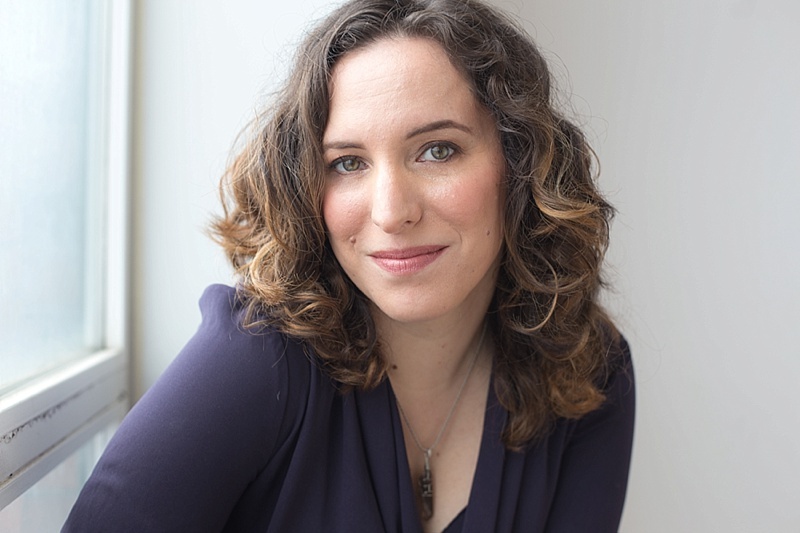 You might be feeling a bit disheartened right now– “Thanks Abby, now I’ve realized that I am living in a way that does not reflect my priorities. That’s just great. What am I supposed to do with this?” But this exercise can be a very positive experience. Ask yourself what you have learned. Have these lists given you any new insights? Have they helped clarify what factors are at play in your life? Where is the biggest discrepancy? What do you want to change? Where do you feel the most motivation? What resonates for you? For some, a list like this can be overwhelming (thanks to “should-ing” and self-judgement), but if you focus on one or two areas where you believe you may be able to make some small changes, it can be incredibly empowering. Small changes can have huge impacts. How will you start living according to your true values? 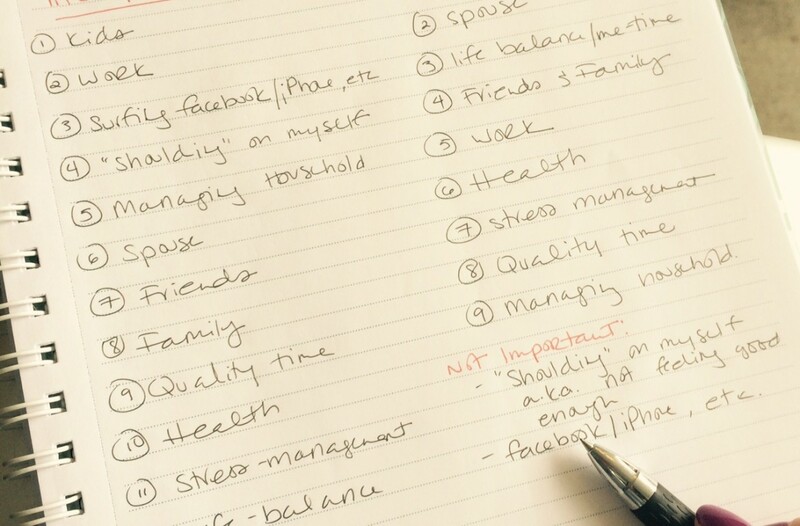 Comment below to share your experience making these lists, and how you plan to re-prioritize. Awesome – can’t wait to hear what you come up with! Hey Abby, very well done! I might give this a try. Great resource! This is a great suggestion. Just looking at the examples above, I can see changes I need to make-how a “no.7” needs to move up to become a “no.3” etc. Self judgement is what holds many of us back, myself included! Thanks for this practical excercise, Abby! Amazing – thank you. I constantly have to remind myself not everything can be “number 1” which helps me make decisions when I feel torn.